The New Nissan Juke N-Tec 2013: New 4X4 Family Crossover Released! Nissan has boosted the appeal of its sector-busting crossover, the Nissan Juke, with the arrival of a gadget-laden, design-focused new model. The Nissan Juke n-tec delivers even more style, higher equipment levels and, like increasing numbers of new cars, features an enhanced Nissan Connect infotainment system with remote connectivity as standard. Based on the existing Acenta Premium model, the new Nissan Juke n-tec adds a striking new look. It rides on 18-inch black and silver alloy wheels and features gloss black B-pillars and door mirrors. There are also black bezels for the bonnet light strips. Inside the Nissan Juke n-tec there’s a gloss black centre console and door trims. Having said that, the star of the Nissan Juke n-tec show is its advanced range of in-car technology. Taking centre stage is the new generation Nissan Connect system, which is fitted as standard to all Nissan Juke n-tec models. Controlled via a large 5.8-inch colour touchscreen, Nissan Connect integrates the Juke’s satellite navigation system with Bluetooth connectivity for mobile phones and MP3 players. The new version also incorporates Google’s Send-To-Car technology that allows owners to plan and send their route to the car before they leave the house. In addition to being more convenient, it’s also safer – removing the temptation to plot a route when on the move (though I have had various issues with Google’s route planning skills so this may not be all good!). In addition, the system also utilises a range of other Google tools such as its Points of Interest database so you can stop at interesting locations and it can also request weather forecasts, local fuel prices and flight information. Perhaps more interesting for those long journeys, Nissan also has an economy readout that ‘scores’ the driver according to how economically they are driving. The smoother and more efficiently they drive, the higher the score. The Nissan Juke n-tec is expected to be the car maker’s best-selling model in the Juke line-up and will be available across all engine and drivetrain combinations. The Nissan Juke n-tec joins the line-up at an exciting time as the Sunderland-built crossover is the firm’s second most popular model behind the Qashqai with 28,862 cars sold in 2012, up from 21,900 in 2011. (And yes, the Qashqai is still one of the UK’s best sellers). More than 500,000 Nissan Jukes have been sold worldwide since launch. The Nissan Juke n-tec is on sale now priced from £16,295 – but see how much this would cost when leased. 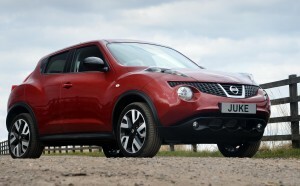 This entry was posted in 4X4 Car, Car Leasing, Cars, Crossover Cars, Manufacturer News, New Cars, News and Views and tagged Acenta Premium, alloy wheels, car, car technology, fuel prices, Google, Google send-to-car, lease the Nissan Juke N-Tec, New Nissan Juke N-Tec, Nissan Connect, nissan juke, Nissan Juke n-Tec, Nissan Juke N-Tec 2013, Nissan Juke N-Tec 4X4, Nissan Juke N-Tec Crossover, Nissan Juke N-Tec Family Car, Nissan Juke N-Tec Google, Nissan Juke N-Tec Price, Nissan Juke N-Tec Spec, Nissan Juke N-Tec SUV, Qashqai, technology, UK by Steve Lumley. Bookmark the permalink.